Commissioned by the Vancouver Art Gallery, and produced with the cooperation of George & Gordon Faulkner, Karen & Peggy Ngan, Adam & Benjamin Segal, Natassia & Tianna Mehan, Amy Campbell & Sophie Burke. Special thanks to Aubrey Nealon and Barbara Hannah. 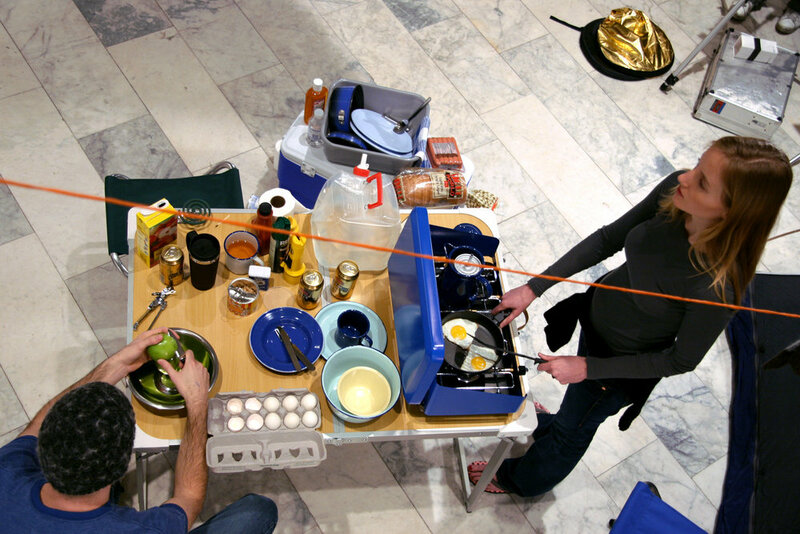 Internal Logic: Camping was performed at the Vancouver Art Gallery on the evening of February 23, 2007. The ten-minute tableau vivant was performed twice. In late 2006 the Vancouver Art Gallery asked me to stage a tableau vivant as part of a performed art series they were holding. My work Cuba Still (remake), a six-channel video installation in which a publicity still from an unknown movie is deconstructed and then reconstructed in video, was being shown there in an exhibition called Acting the Part: Photography as Theatre, organized and toured by the National Gallery of Canada. I contemplated how best to stage a tableau vivant for a live audience. While I had been staging tabeaux vivants for the past six years, recording them on digital video, I had never deliberately staged one as a public performance. Valuing the immediateness of performance and the presence of a captive audience, I endeavoured to create a spectacle. How could I create a performance piece that did not point to me as the artist, standing behind the camera and capturing the performance? My Stills works, or video-recorded tableaux vivants, are always in dialogue with what could be called the ‘photographic’ – in other words, what makes a photograph a photograph, and how could a video become a photograph? By removing most of the movement in the scene, and by locking down the camera on a tripod I take the privileged moment represented in a photograph and stretch it out for a period of 5-10 minutes. The result is a video that looks like a still image, or perhaps a very slowed-down movie, but is in fact a recorded segment of time where living models try remaining as still as possible, therefore performing a photographic moment. While a photograph is the index of a specific moment when the shutter opened for a fraction of a second – the before and after firmly implied – in my videos time itself becomes a crucial element, the live image negating the imagined before and after, insisting on the live/lived present. While my Stills do contain a performative aspect, explicitly enacting a performance of them was a different story. If there were going to be a live performance, how would it be recorded? What if the index was a human one? Would the audience hold the record of the action? What if the index was staged through a mirroring of the models? In responding to these questions, eventually I arrived at the idea of posing identical twins in a mirror-image tableau vivant. I sketched my idea through computer modelling to think through the idea visually and settled on a camping scene with an artist (not myself) recording the four campers on video. The visual signs of camping are easy to convey, and the incongruousness of a family camping in the classic marble rotunda of the Vancouver Art Gallery was appealing to me. Looking at the piece it seems like there is a mirror down the center of the room, but in this situation there is no original, no copy. The two halves exist as the reflection of each other, yet are obviously not – the twins each have their own thoughts, their hearts beat independently and while they try to maintain similar poses, they are not the same person. It was my intention with this piece to make the audience aware of their own bodies, the way they imagine themselves in space/time and are imagined by others in the same matrix. 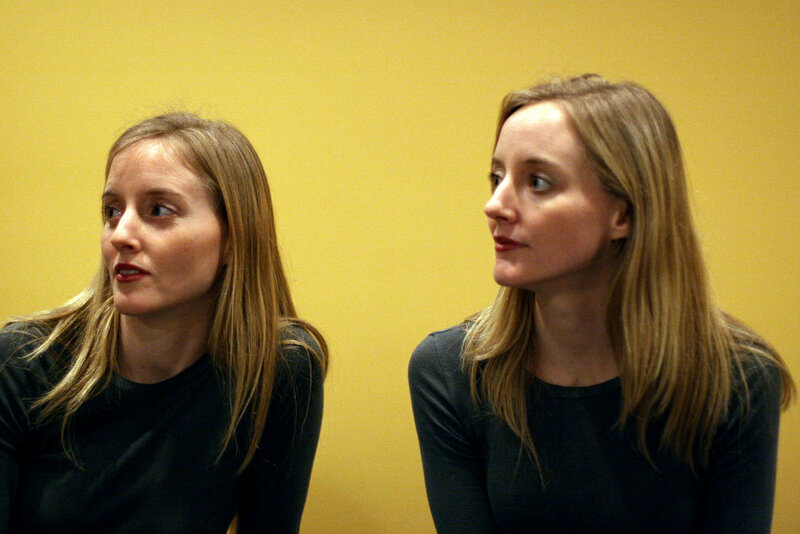 While it took three months to find the right identical-twins (mostly through friends and friends-of-friends), the piece was produced over a period of four days: three days to buy and set up all the props, meet the models, buy matching clothing, etc., and then a day to rehearse with the models and make final adjustments. The piece was performed twice on February 23rd, 2007, with the models posing as still as possible for just over ten-minutes on each occasion.